By Wade Allison - posted Monday, 6 January 2014 Sign Up for free e-mail updates! To support a sizeable population, civilisation needs energy and mutual trust as well as food and water. Both of these have been damaged by official and public reactions to what happened at Fukushima Daiichi in 2011, but the basis for these reactions is fundamentally unsound. Originally man relied for energy on the digestion of food like all animals, but at a historic moment he began to domesticate fire as a source of external energy for lighting, cooking and heating his home. Although this was a dangerous step, it was essential to civilisation. 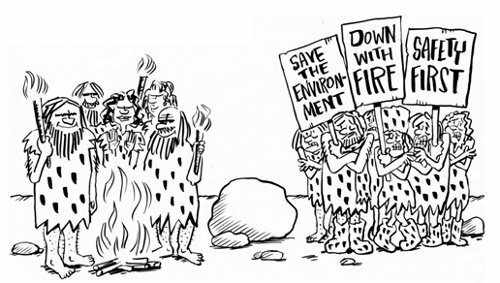 No doubt the environmentalists of those days objected and had a strong case, but they had to accept that the benefits outweighed the dangers, provided education and training in the use of fire was given to everybody including children. At the start of the 20th Century a similar decision was made to use mechanised traffic. Nobody denied that there were places of great danger but again the solution was education and training, and from a young age everybody learnt to avoid these dangers. Modern society would have been severely hampered if fire had not been brought into the home or if we were still worrying about further restrictions on road traffic - or even ruling it out. Today, in a similar debate about the use of nuclear energy, the risks are far less than those of fire or traffic, as shown by the accident at Fukushima, but the required public education and training has never been given and primitive fear persists. On 11 March 2011 and the days following there was a natural disaster, an unnecessary panic and a self-inflicted social disaster. An exceptional earthquake generated a tsunami responsible for over 18,000 deaths. Neither the tsunami nor the quake damaged any nuclear reactors in Japan, but at the Fukushima Daiichi plant the ancillary diesel generators were destroyed so that the emergency power then failed. As a result the reactors overheated and radioactivity was released from the fuel assemblies into the cooling water and also into the atmosphere when the pressure was vented to avoid a rupture. Outside the reactor the vented hydrogen exploded chemically and this was seen on video around the world. Unlike Piper Alpha and Deep Water Horizon this accident killed no one immediately and, as will be explained, no late casualty from the radiation is expected. Nevertheless, political authorities and media worldwide, with an understanding of nuclear matters informed more by Hollywood than science, panicked. The imagined dangers of the worst possible spooked public opinion and caused a serious breakdown of trust in science and, more widely, in authority and society in general. This has had serious economic consequences in Germany, Japan and many other countries. Just at the time when the dangerous effect of fossil fuels on the environment has begun to be appreciated, nuclear energy, the sole reliable solution, is being scaled back. Locally in Japan itself large scale evacuation, both voluntary and compulsory, has destroyed many communities and over 1000 people have died from the extreme stress caused. Food supplies have been condemned and businesses ruined. How dangerous to life is nuclear radiation? How can we build public trust in the answer? The first is a purely scientific and medical question that can be answered with evidence and also understanding of the how and why. These must fit together to leave no doubt. Actually this is a well trodden path, for research and experience with radiation goes back well over a hundred years. Knowing whether it is dangerous to life (shown symbolically by the green sphere below) we can answer all the consequential questions (shown by the red sphere). For example, worries about nuclear waste should only be important in so far as nuclear radiation is exceptionally dangerous. Concerns at an international level are symbolised by the violet sphere. For instance, nations are only open to black mail by a terrorist group or rogue state if the related threats frighten the public of the nation. In fact today, a dirty bomb would be a far greater threat to public order than to health. The second question is more difficult. How is it possible to create trust, especially if it has been lost previously? One approach is to think of a similar problem and study how that has been tackled successfully. 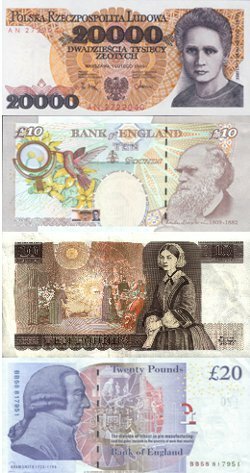 For example, banks must create trust in the currency need everyone in society to value their grubby pieces of paper, the bank notes. How do they do it? Some carry pictures of kings, queens or presidents while others use images of famous scientists or literary figures as symbols of trust that everybody respects. Since some of these have a natural connection with radiation and the nuclear story we have a possible way forward. This is the first in a two part series on the risks and benefits of nuclear power. The second can be read by clicking here. The author is a member of the SARI group, Scientists for Accurate Radiation Information http://radiationeffects.org/ This article is based on an invited lecture given at the Second AGORA Conference, Tokyo. and at the British Chamber of Commerce in Japan, 8 and 9 Dec. 2013. 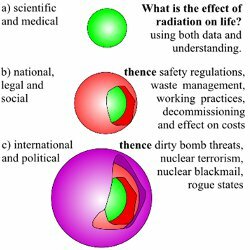 A more extended discussion with references may be found in the book Radiation and Reason available from http://www.radiationandreason.com together with other recent articles in Kindle, ePub, Japanese and Chinese editions, also available from Amazon. Professor Wade Allison MA DPhil is an Emeritus Fellow of Keble College, Oxford and the author of Radiation and Reason and Fundamental Physics for Probing and Imaging.